Size: approx. 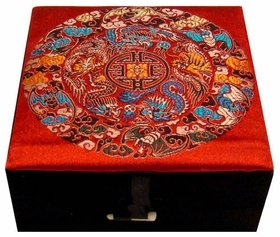 5.5" x 5.5" x 2.25"
This beautiful jewelry box is decorated with traditional Chinese good fortune and dragon symbols. The jewelry box is covered with satin. Perfect as a gift or use it as a decoration in your home. As one of the ancient handicrafts of China, embroidery has greatly contributed to the progress and enhancement of China's material civilization. Historical documents record the use of embroidery in China as early as 2255 B.C. Despite the numerous transformations of the twentieth century, the art of embroidery--which fully embodies the merit of traditional Chinese culture-lives on. Embroidery combines the essence of painting and calligraphy and presents traditional Chinese culture through the colorful threads of the skilled embroiderer. This hand-crafted silk box is covered with an elegant red silk that is embroidered with an floral and dragon theme. The symbol in the center represents Long Life.